For its proponents, proportionality analysis is integral to a new "global model of constitutional rights." If economic and social rights are part of that global model, a suggestion supported by recent empirical analysis, there are numerous sites on which to establish the proportionality analysis. And yet, the comparative economic and social rights jurisprudence reveals little resembling proportionality analysis, otherwise so "ubiquitous" in constitutional rights adjudication. Instead, the adjudication of economic and social rights integrates notions of proportionality in a seemingly indirect faction, through giving substance to standards of "reasonableness," "appropriate measures," and "progressive realization...according to maximum available resources." These standards share with proportionality analysis the rejection of more content-driven, results-oriented, or rule-like conceptions of economic and social rights, such as the minimum core. But that rejection alone does not answer the question how proportionality, whether as principle or structured approach, relates to these new standards, particularly to that of reasonableness, a standard that now sets the framework for previously-absent international scrutiny on economic and social rights. 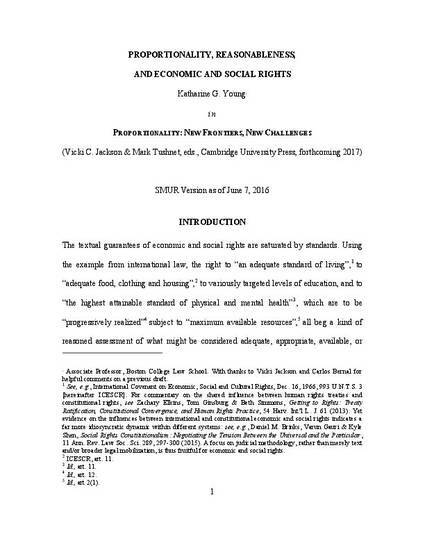 In this chapter, which is part of a forthcoming edited collection, by Mark Tushnet and Vicki Jackson, on Proportionality: New Frontiers, New Challenges, I examine the relationship between reasonableness review and proportionality within the context of economic and social rights. Both standards hew closely to the ideal of a "culture of justification." Both too set out a measured assessment of the principle of proportionality, which we might summarize as the view that "the graver the impact of the decision upon the individual affected by it, the more substantial the justification that will be required." Yet they do so under methodologies that are critically different. Part I of the paper sets out the developing approach to reasonableness review in South African constitutional law. The choice of this jurisdiction is pertinent as an early, sophisticated and influential example of the reasonableness standard, which was forged by the court in the presence of both clearly enumerated and justiciable constitutional economic and social rights, and a structured limitations clause. In Part II, I contrast this approach with proportionality analysis, which has been deployed in civil and political constitutional rights cases in South Africa, but far fewer economic and social rights cases. In Part III, I discuss a more direct integration of proportionality into reasonableness review, and suggest what is gained, and what is lost, by this approach. A final question is whether reasonableness review, developed out of largely common law traditions, will travel as well as proportionality analysis purports to do.